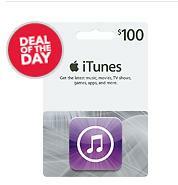 If you are looking to save on iTunes Gift Cards, check out the Best Buy Deal of The Day: $100 iTunes Gift Card for $85! It even includes Free Shipping. Ebates currently has 2.5% cash back on Best Buy purchases. If you have not signed up for Ebates, go HERE first. At times, the amounts may seem small for each purchase, but it does add up over time!